So it's that time of the year again, the time when just like Richard Feynman and Paul Dirac, three select individuals get to mull over whether they will incur more publicity by accepting the Nobel Prize or rejecting it. Predicting the Nobel Prizes gets easier every year ((I said predicting, not getting your predictions right) since there's very little you can add in the previous year's list, although there are a few changes; the Plucky Palladists can now happily be struck off the list. As before, I am dividing categories into 'easy', and 'difficult' and assigning pros and cons to every prediction. The easy ones are those regarding discoveries whose importance is (now) ‘obvious’; these discoveries inevitably make it to lists everywhere each year and the palladists clearly fell into this category. The difficult predictions would either be discoveries which have been predicted by few others or ones that that are ‘non-obvious’. But what exactly is a discovery of ‘non-obvious’ importance? 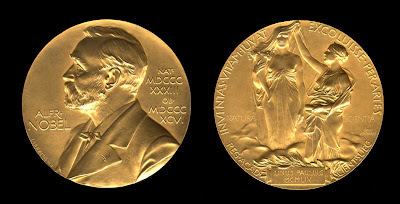 Well, one of the criteria in my mind for a ‘non-obvious’ Nobel Prize is one that is awarded to an individual for general achievements in a field rather than for specific discoveries, much like the lifetime achievement Academy Awards given out to men and women with canes. Such predictions are somewhat harder to make simply because fields are honored by prizes much less frequently than specific discoveries. When predicting the Nobel prize it's also prudent to be cognizant of discoveries whose recognition makes you go "Of course! That's obvious". Prizes for the charge-coupled device (CCD) (2009) integrated chip (2000) and in-vitro fertilization (2010) fall into this category. Pros: Computational chemistry as a field has not been recognized since 1999 so the time seems due. One obvious candidate would be Martin Karplus. Another would be Norman Allinger, the pioneer of molecular mechanics. Cons: This would definitely be a lifetime achievement award. Karplus did do the first MD simulation of a protein ever but that by itself wouldn’t command a Nobel Prize. The other question is regarding what field exactly the prize would honor. If it’s specifically applications to biochemistry, then Karplus alone would probably suffice. But if the prize is for computational methods and applications in general, then others would also have to be considered, most notably Allinger but perhaps also Ken Houk who has been foremost in applying such methods to organic chemistry. Another interesting candidate is David Baker whose program Rosetta has really produced some fantastic results in predicting protein structure and folding. It even spawned a cool game. But the field is probably too new for a prize and would have to be further validated. Another favorite for years, with Stuart Schreiber and Peter Schultz being touted as leading candidates. Cons: This again would be more of a lifetime achievement award which is rare. Plus, there are several individuals in recent years (Cravatt, Bertozzi, Shokat) who have contributed to the field. It may make some sense to award Schreiber a ‘pioneer’ award for raising ‘awareness’ but that’s sure going to make a lot of people unhappy. Also, a prize for chemical biology might be yet another one whose time has just passed. Pros: The field has obviously matured and is now a powerful tool for exploring everything from nanoparticles to DNA. It’s been touted as a candidate for years. The frontrunners seem to be W E Moerner and M Orrit, although Richard Zare has also been floated often. Pros: Another field which has matured and has been well-validated. Gray and Bard seem to be leading candidates. Among other fields, I don’t really see a prize for the long lionized birth pill and Carl Djerassi; although we might yet be surprised, the time just seems to have passed. Then there are fields which seem too immature for the prize; among these are molecular machines (Stoddart et al.) and solar cells (Gratzel). Pros: The importance of these proteins is unquestioned. Most predictors seem to converge on the names of Chambon/Jensen/Evans. Arthur Horwich and Franz-Ulrich Hartl just won this year's Lasker Award for their discovery of chaperones. Their names have been high on the list for some time now. Pros: Clearly important. Chaperones are not only important for studying protein folding on a basic level but in the last few years the malfunctioning of chaperones such as heat-shock proteins has been shown to be very relevant to diseases like cancer. Cons: Too early? Probably not. Akira Endo’s name does not seem to have been discussed much. Endo discovered the first statin. Although this particular compound was not a blockbuster drug, since then statins have revolutionized the treatment of heart disease. Cons: The committee is not really known for awarding actual drug discovery. Precedents like Alexander Fleming (antibiotics), James Black (beta blockers, antiulcer drugs) and Gertrude Elion (immunosuppresants, anticancer agents) exist but are far and few in between. On the other hand this fact might make a prize for drug discovery overdue. A lot of people say that Venter should get the prize, but it’s not clear exactly for what. Not for the human genome, which others would deserve too. If a prize was to be given out for synthetic biology, it’s almost certainly premature. Venter’s synthetic organisms from last year may rule the world, but for now we humans still prevail. On the other hand, a possible prize for genomics may rope in people like Carruthers and Hood who pioneered methods for DNA synthesis. Now this seems to me to be very much a field from the "obvious" category. The impact of DNA fingerprinting and Western and Southern Blots on pure and applied science- everything from discovering new drugs to hunting down serial killers- is at least as big as the prizeworthy PCR. I think the committee would be doing itself a favor by honoring Jeffreys, Stark, Burnette and Southern. And while we are on DNA, I think it's also worth throwing in Marvin Caruthers whose technique for DNA synthesis really transformed the field. In fact it would be nice to award a dual kind of prize for DNA- for both synthesis and diagnosis. Cons: Picking three might be tricky. This seems to be yet another favorite. McCulloch and Till are often listed. Unfortunately McCullough died earlier this year so it would be a little unfair to award just Till. However such a thing is not unprecedented. For example, the psychologist Daniel Kahneman shared the 2002 Economics Nobel Prize with Vernon L. Smith. Left out was his long-time collaborator Amos Tversky who had died in the 90s; it's pretty much regarded as a given that Tversky would have shared the prize had he been alive. Pros: Surely one of the most important biological discoveries of the last 50 years, promising fascinating advances in human health and disease. Cons: Politically controversial (although we hope the committee can rise above this). Plus, a 2007 Nobel was awarded for work on embryonic stem cells using gene targeting strategies so there’s a recent precedent. Pros: Clearly important. The last trafficking/transport prize was given out in 1999 (Blobel) so another one is due and Rothman and Schekman seem to be the most likely canidates. Plus, they have already won the Lasker Award which in the past has been a good indicator of the Nobel. A commenter reminded me of this. When the latest GPCR structure (the first one of a GPCR bound to a G protein) came out I remember remarking that Kobilka, Stevens and Palczewski are probably up for a prize sometime. Palczewski solved the first structure of rhodopsin and Stevens and Kobilka have been churning out structure after important structure over the last decade, including the first structure of an active receptor along with several medicinally important ones including the dopamine D3 and CXCR4 receptors. These feats are definitely technical tour de forces. Pros: GPCR's are clearly important for basic and applied science, especially drug discovery where 30% of drugs already target these proteins. I have also always wondered whether non-linear dynamics and chaos deserves a prize. The proliferation and importance of the field certainly seems to warrant one; the problem is that there are way too many deserving recipients (and Mandelbrot is dead). The first paper by Moerner was in 1989 on single molecule spectroscopy in condensed phases, and Orrit was the following year. So 21/22 years later seems pretty reasonable to me, given how long it’s taken other work to be recognized. Although who knows – maybe this one might end up as a Physics prize? I can’t strictly disagree with your picks for computational chemistry/biochemistry, but no matter how these play out, we’re going to miss someone. From the MD point of view, Karplus is fine but we'd be missing out on the other heavyweights in MD: Car & Parrinello for sure, and maybe some of the pioneers of MD as applied to chemically relevant systems (Chandler, Berne, among others). I know Rahman passed back in the 1980s, but Alder is still alive and kicking last I heard. Can't recall about Wainwright, though. This might end up in Physics as well. 3.) Steve Harris for EIT and Lene Hau for her subsequent work on optical physics (the “slow light” research). It would also be neat to see Aharonov and Berry pick up a Nobel for their work in topological and geometric phases (and it’d be an excuse to share my favorite classical example of a geometric phase with everyone I run into that day). And an idiosyncratic and perhaps an admittedly premature choice for the fluctuation theorem and related work in nonequilibrium thermo/stat mech. Here, I'd say it's a tossup between Searles, Evans, Jarzynski, Crooks, Cohen, and others I'm forgetting. Probably too early for this year, but the explosion of GPCR structures in the last 4 years is deserving, most likely in Medicine. The 1st "active" conformation structures were published this year. Brian Kobilka & Ray Stevens would be at the top of the list. What is so controversial about the discovery of hematopoietic stem cells by McCulloch and Till? I think it is the embryonic stem cells that are politically controversial. And, as you noted, Martin Evans, who first derived embryonic stem cells from mice, won the Nobel Prize in 2007. But Till is not likely to win, now that McCulloch is dead. I don't question the importance of nuclear receptors. But since nuclear receptors are regulators of transcription after all, I still feel Robert Roeder (mentioned by MJ) deserves a credit. Of course the complicating matter is that they have awarded the Chemistry Prize to Roger Kornberg for eukaryotic transcription in 2006. My compromise would be to give the Physiology/Medicine Prize to Roeder and Chambon. Come to think of it, Chambon has had a remarkable career. Like Roeder, he showed the existence of multiple RNA polymerases. Like Kornberg, he contributed to elucidation of chromatin structure. He is among the early discoverers of introns. He also discovered transcription enhancers. I think the easy predictions for the Physiology/Medicine Prize would be Rothman and Scheckman (membrane vesicle trafficking) or Gurdon and Yamanaka (reprogramming) based on other awards they have won. GPCR structure mentioned by JMB is also likely, but perhaps a little too soon. The discovery of small RNAs (Ambros, Ruvkun, and Baulcombe) is also a possibility, although it could be considered too close to RNAi. As for the Physics Prize, I agree with you that the time is ripe for the trio of Clauser, Aspect, and Zeilinger to win. For years, I thought neutrino oscillation would win. But Yoji Totsuka died in 2008. (Is it a coincidence that three other Japanese particle physicists shared the Physics Prize in 2008?) They could still give the prize for neutrino oscillation, but question is, to whom. (Arthur McDonald and ?) As MJ mentioned, Berry and Aharonov (and possibly Tonomura) may win. If Berry wins, it will be two Ig Nobel Prize winners winning the Physics Prize in a row. Yes, I remember remarking when the recent GPCR-G protein structure came out that there is probably a prize in the wings for Kobilka, Stevens and Palczewski. But I agree that's probably a little too soon. Scheckman and Rodman followed by the nuclear receptor people (and Roeder seems to be an apt choice too) would be my top contenders for Medicine. Another possible choice is Langer from MIT, although his would be more of a "lifetime achievement" award which is rare. I was not aware of the physicists mentioned by MJ, seem like worthy contenders. Would dark matter or energy deserve a prize? Probably not until we actually know what they are. Aspect, Clauser and Zeilinger have been top of my list for a while. What about a prize on amyloids and protein aggregation? Maybe too early stll? I don't think it will happen until the increasing confusion about the precise role of amyloid is sorted out. Could I appreciate Gray, for the whole of his "colourful" career? a wide-spectrum scientist (and always on high levels) would be a better ensign for 2011IYC than a good specialist of a narrow sector. To be honest, the MD was already there and all Karplus did is take Shneior Lifson's force field(adviser of Warshel and Levitt, who btw contributed equally along with Martin) and extend it for treating the proteins. Especially, if you take the model of 1999 prize, then only Alder and Wainwright could be considered for the prize, since they were the ones who truly uncovered the power of MD simulations as exploratory tool for complex condensed matter problems. Instead, I would award the prize for people who devised physical theories to describe the protein folding phenomena, effectively putting an end to Levinthal's paradox. Those deserving the credit for solving the "protein folding" problem are: Peter Wolynes and Eugene Shakhnovich. I don't know...I think Wolynes's idea of the folding funnel has been very productive but it is one of several useful models (admittedly one of the most influential ones though). I have always thought of a "lifetime achievement" kind of award for Karplus as one of the true guiding lights of the whole field of biomolecular simulation.